The NY Toy Fair 2010 started yesterday and this morning FBTB website had already published photos from every 2H set, at Flickr. Great is that we finally got some decent resolution images from all the 2H Technic sets. Click at each image to get the correspondent highest resolution image available. Depending on the browser you are using, you may need a 2nd click over the image, for the full resolution image where you will need to pan in order to inspect each detail. This is not the first set with a 3-inline motor (only 8455 had one before), but the shaft is farthest to the cylinders for the firs time, so it got a new crank design. Instead of the 2852 (Technic Engine Connecting Rod), I guess this motor uses cranks made with an axle towball with angled connectors #1 and #2 (well... not angled in this case). This model has a registration plate with the characters "AP 54183", which makes me think it was designed be Alfred Pederson. 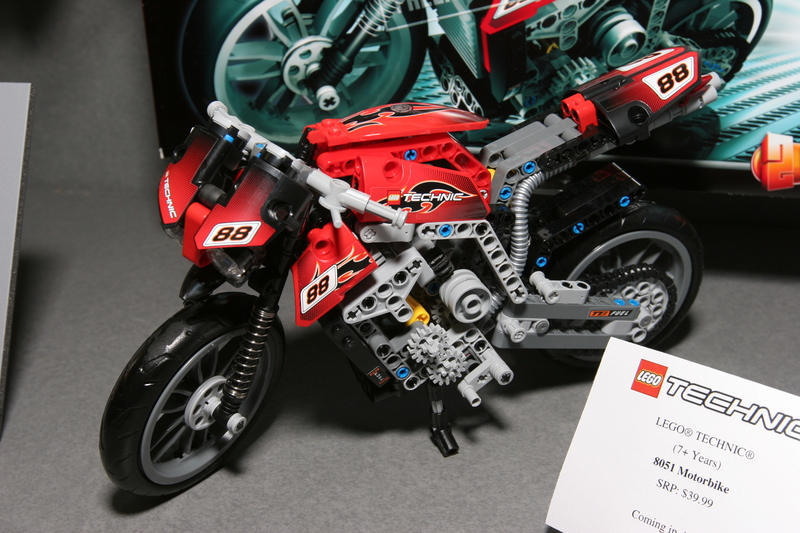 This is the model where the only new Technic part for the 2H, was found up to now. It is a reinforced new variant from 48496, with axle-holes instead of pins as connection points. My guess is that it takes the function of part 61904, where a Linear Actuator isnot present and its form factor doesn't make a perfect fit. The several stickers with the inscription "MK 8053" leave no doubts about who have designed this model. Markus Kossman of course, who had also designed its predecessor 8421 XXL Mobile Crane. There is also a small sticker on the cabin "door" who leaves us with any doubts about who have designed this beauty. "Goose" which makes a perfect match with the nickname from Anders Gaasedal Christensen and the sticker with model name (8043ag) which matches also his initials. If it was not yet clear for you, that all the 6 functions from this Excavator (3x for the digging arm, driving, steering and superstructure rotation) are fully remote controlled, take a closer look and read the text in the box PF banner. "Fully remote controlled digging function"
"Remote controlled driving, stearing and turning"
So there is definitely a steering function on this infernal machine. 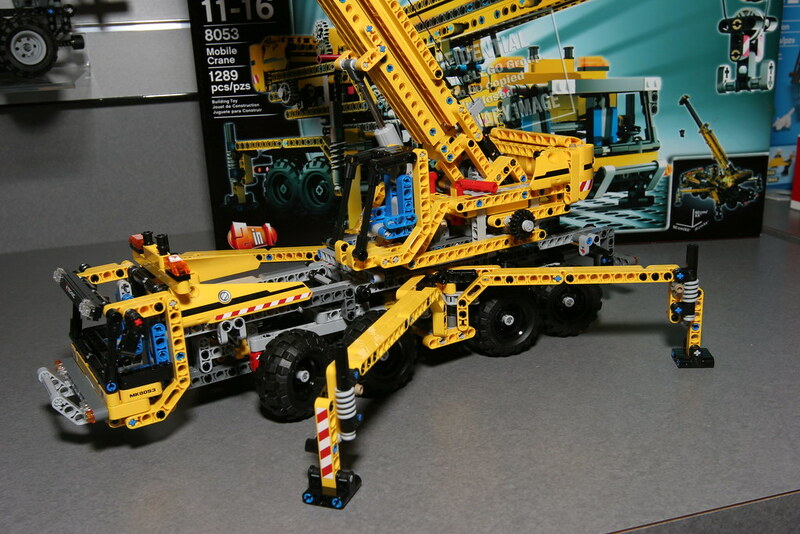 For a few more photos, you may take a look at the Technic photostream, from FBTB. Does that mean that it is designed by "TechnicBricks"? 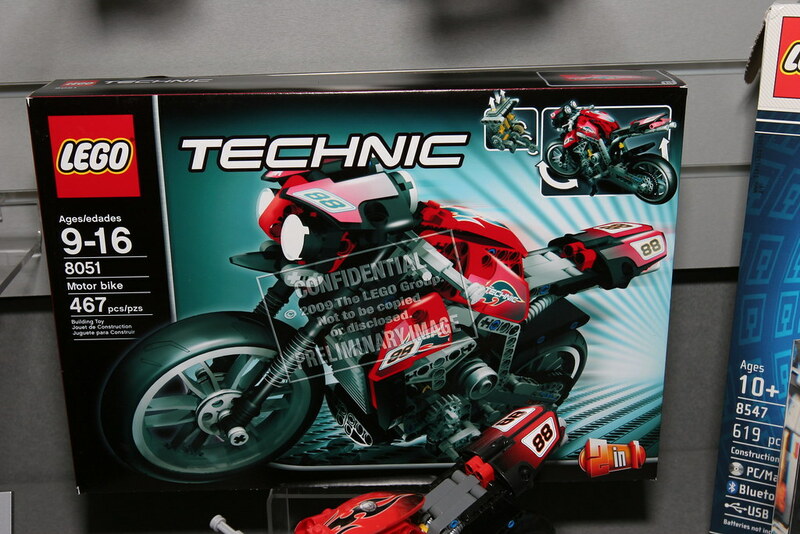 The red lever in front of the battery box looks like it could be for a manual swith between functions. Also is the drive for the tracks at the rear here? With what they are trying to do with this model it likes they have done very well (looking at the photos thus far). Think about the target group and objectives they have to work with. As for us AFOL's it just gives us more scope to make it the way we want it. I'm going to get one for myself and try some modifications. 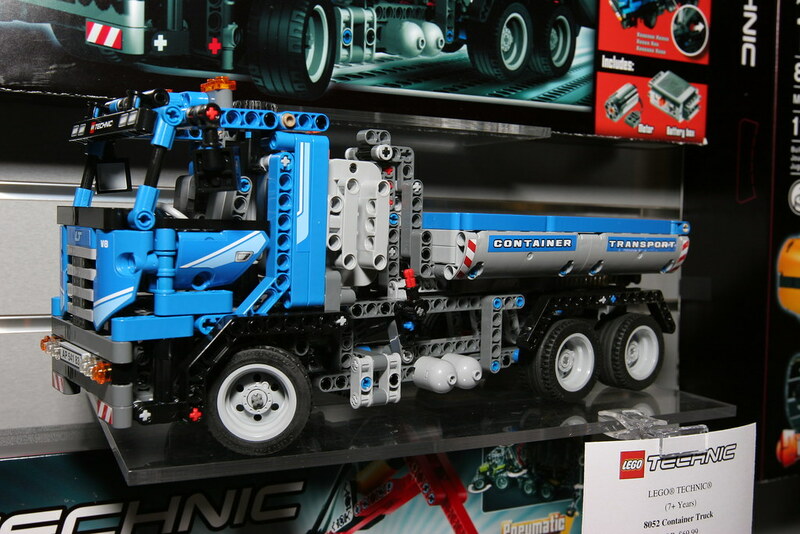 May look at replacing the bucket with the one from 8851. I think the red lever on the superstructure is not for manual operation, but for indication of the actual functions selected via remote (a red lever too). However it may happen that it also allows for manual switching. The motorbike has new longer cranks (yellow). They seem to be 2 studs longer than usual ones. what does the red piece infront of the battier box do? We don't know. But the theory is that there's a transmission device in there to allow mode switching and the red piece would be for the changeover catch. That new part is also in the excavator. It's in the drive train of the tracks ( a half 12z and half 20z are in it ). The red piece is indeed the indication or the function selector. You can see the sticker besided it. Let's hope that they indeed motorized it. Are the axle-extensions (you can seen them on the beam of the crane, to extend te beam) also changed? They look different, but maybe it it the light. 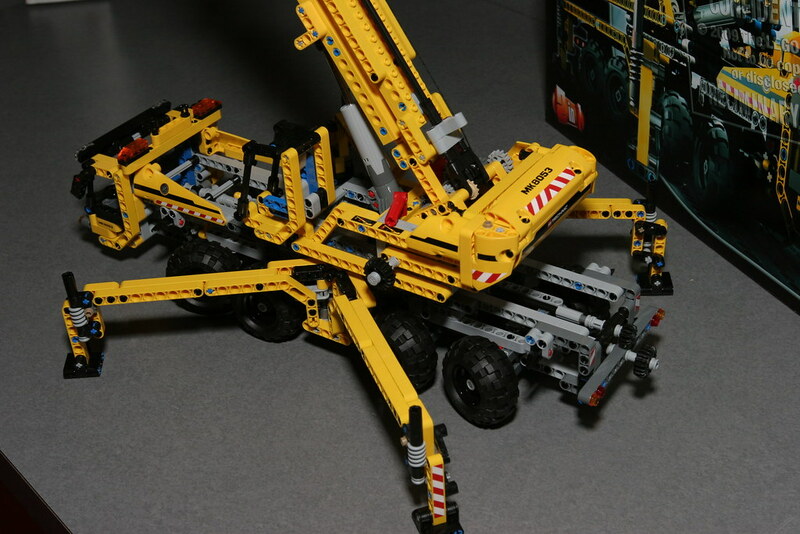 An other interesting thing is the number of functions on the crane. There are two wheels at the back: rotating upper structure and in/out extenders. But there are also two red selectors on the upper structure. One is changing from up/down of the beam to the hook, but what is the other one doing besides extending the beam? Maybe it controls the stabilizers opening, from the upper structure!? Otherwise, where is the steering knob? IMHO, one of the function may be manual. Since the are yellow knob wheels between the "cockpit" and the first axle, I think that the rear 12t controls the stabs (the 20t is for steering of course). The rotating structure may be manual. Like 8421. @ Ryan : yeah, very very good idea !! This theory is very relevant ! 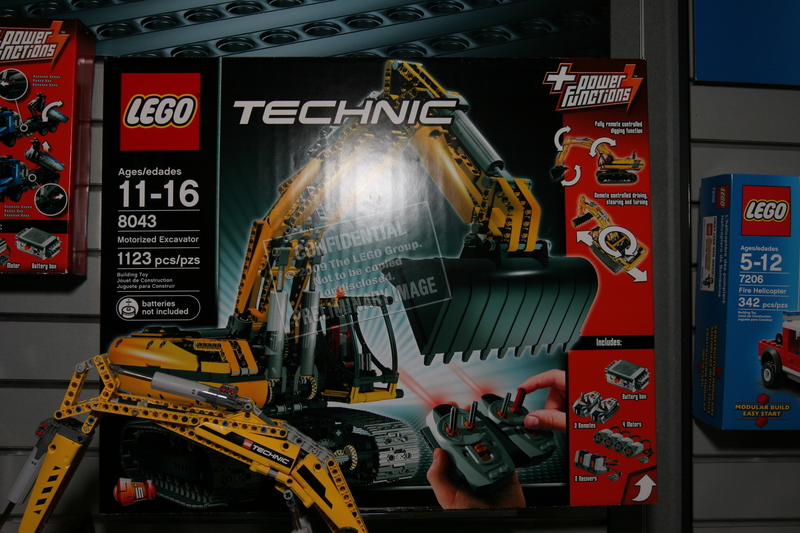 So the gear configuration driving the two parallel actuators on the box (on the excavator) was actually correct -- apart from the colour. (it looked like it would send the actuators opposite directions) They're the new 20T bevel gears with round holes instead of axle holes. Yes those are the new 20 gears. I still believe the treads of the excavator can only move simultaneously. So no steering possible. From the red "selection switch" on the left of the Crane Truck's superstructure and the past record of sets like the 8294, 8295 and 8265, I'd say the boom raising and the cable drum are motoriseable. If you look at the power functions section on the right of the box, it reads 'remote controlled driving, steering and turning'. To me, 'driving' = forward/reverse, 'steering' = left and right, and 'turning' = rotation of the superstructure. Assuming 1x M Motor is used for each set of tracks, then one motor is still available each for rotation of the superstructure and changing gears (to switch between the arm movements and the lower functions) - this would mean that the driving movements could function the same as the 8275 bulldozer, which would include forward, reverse, turning left and right in forward or reverse and also 360’s clockwise and counter-clockwise. I really hope this is the case. The only concern I have is that 8275 utilises an XL Motor for each track. Although 8043 is roughly 250 part count less than 8275, it still looks quite heavy – I guess it may be geared down a bit to relieve strain on the motor, which would result in a slower movement, but, excavator’s ain’t race cars! Really looking forward to picking this one up around September (Australia). You guys notice that gear in the Container Truck, right below the container flatbed? It's a double bevel one, and oddly light, tan maybe? And it's a large one. Thus, a gear z36 recolored in tan? Bright, not light, I mean.. So, this towball moves from the left to the right and vice versa. Green arrow : its wire. PS : sorry for this useless message. I only see a couple of 16 tooth gears (grey), 1 20 tooth gear (tan), a 12 tooth gear (black) and a 8th gear. Can you tell us more precize where you see a clutch gear? The right gear box has only one function. Like one of the gear box of the "8258-B. We should see a part of the sticker there. And it is not the case. the 12t knob : for the stabs. the 20t knob : the steering of course. Rotating the structure is manual. Like #8421. The most likely I should say. The excavator is looking more complex than I had anticipated. I'm so glad it's not like the bulldozer where it was all motors and no complexity. That is a relief. 3 motors controlling 6 functions via a gearbox switched by a fourth motor is great. But the price!!!!!! 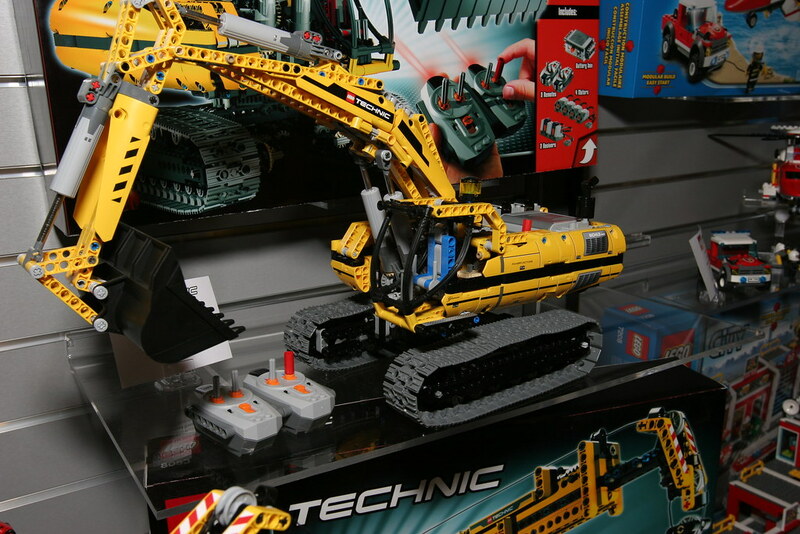 Although I've really changed my mind about the excavator, I'm sorry but I can't justify paying that much for what it is. If it was a little bit bigger and pneumatic (yes just like I constantly bang on about with pistons at least twice as long and with more efficient/effective motor compressor pump) and the second set of motor functions being used to operate the valves, then i'de buy at least two for the same (or even higher) price.